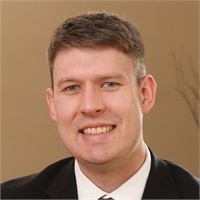 Andrew Ulvestad | Cornerstone Financial Solutions, Inc.
Andrew is the newest Cornerstone team member, coming to us in November, 2018 with his Series 7, 66, and Insurance licenses. He works closely with and assists the Financial Advisors in the administrative aspects of developing financial plans and recommendations that help clients meet and exceed goals, as well as investment research and assisting clients with financial questions. Huron natives, both Andrew and his wife, Tara, graduated from James Valley Christian School and South Dakota State University. They have one child, Bentley. During the winter months, you can find Andrew coaching 7th and 8th grade boy’s basketball at James Valley Christian. If you could pick up a new skill in an instant what would it be and why? Playing the piano…I quit piano and I was very good, and I think I would really enjoy it. What’s your favorite family tradition (current or something from the past)? I took part in my wife’s family Thanksgiving Day football game and had a blast…already preparing and training for next year! !